Fog is the last thing you should have to deal with in situations where you need to wear safety glasses. Anti fog safety glasses are necessary in safety situations where you have to deal with fogging. Without question, fogged lenses are dangerous and can cause serious injury or death. Anti fog glasses are the only way to stay safe in such a situation. Prescription safety glasses with anti-fog coating are a perfect solution for prescription wearers who need safety in an environment where fogging is an issue. Whether you’re going from cold to hot environments, working around a lot of moisture, or dealing with an environment that makes you sweat, fogged lenses are a serious threat to your safety and the safety of those around you. If fogging is an issue where you work, anti fog safety glasses should be a priority. If you’re considering getting prescription safety glasses and you work in an environment where fog is an issue, our Fog Free prescription safety glasses may be your best choice. Fog Free coating is a molecular coating that completely eliminates fogging on both sides of your lenses. 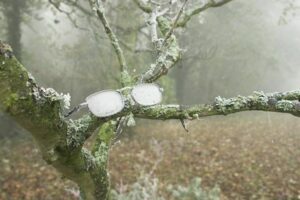 Fog Free coating is perfect for prescription safety glasses in situations where you need to stop glasses from fogging. It will eliminate dangerous fog and keep you and those around you safer. Anti fog safety glasses are absolutely necessary in situations where fogging is a risk and you need to wear safety equipment. White-out blindness caused by fog is the opposite of safe. Prescription safety glasses with Fog Free coating won’t fog. At all. The coating, however, should be “recharged” once a month using DeFogIt! wipes, which we sell. Fog Free coating is available on clear, polarized, and Transitions lenses. Fog Free coating will not work with other coatings because of its special molecular composition, but it does include its own anti-scratch built into the coating. Using safety glasses that fog endangers you and the people around you. It only takes one badly-timed fog-induced white-out to cause a serious or permanent injury. If you want to stop glasses from fogging, anti fog safety glasses with Fog Free coating are the best choice. This coating is state of the art and the best coating for anti fog glasses on the market. There is no question; fog is deadly. If you are interested in Fog Free, have some questions, or want to know more, give us a call or leave a comment below. Once you get your pair of anti fog glasses with Fog Free coating, we’re sure you’ll be amazed at what the elimination of fog can do for you.